All you need is an Android phone with NFC support, and can be ‘unlocked’ with a 99c in-app purchase. This isn’t exactly ‘brand new’, the ability to read a balance off a transit card, as it has been previously possible using apps like FareBot for the Clipper, EZ-Link and Suica cards. Or Hong Kong’s Octopus card with NFCard. 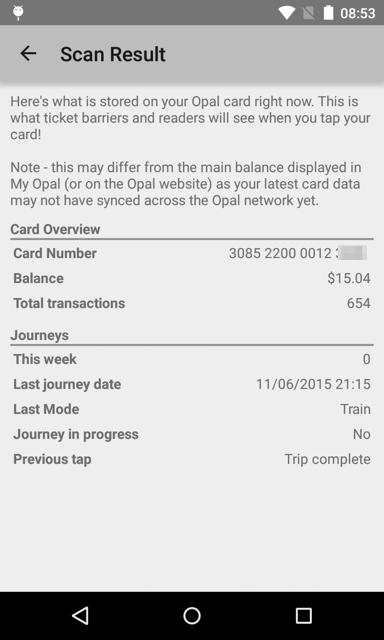 The ability to read Opal card data is the unique thing here. Due to the stored value nature of the Opal card and the way the system is architected, the card itself stores basic information so that it can operate without a need to ‘phone home’. Transport officers already do this – the Samsung handheld devices can read the balance and other information off an Opal card (and submit an infringement notice from the same device), so that everything is there and ready to read and access. However, the Samsung devices that Transport Officers have, naturally have ‘officially sanctioned’ apps, including decryption keys to read more information than what My Opal exposes. For example, cards also store their concession/entitlement value, a list of transactions, etc – this isn’t exposed in the unencrypted area that My Opal uses. 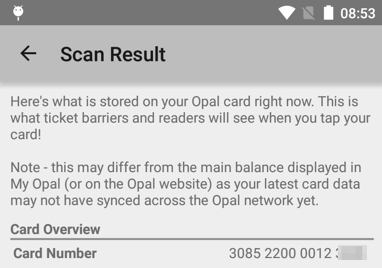 However, now ‘My Opal’ is able to read and decode the information available in the unencrypted area of your Opal card. You’re able to see your card number, balance, total transactions, the number of journeys you’ve made this week, the last mode you took, whether your journey is in progress, what your previous tap was, and your last transaction (which is currently listed as your last journey date). This information is considered up to date, as it is the information that the Opal card readers at barriers, stations, wharves and on buses will be using to calculate your fares. The other benefit over relying on the website is that your last transaction date is listed – the website doesn’t list the tap off time, which can be important when it comes to the 60 minute transfer window. If you tap on at 10:00, tap off at 11:00, the only time shown online would be the tap on time. If you want to then start a new journey, you’ll have to remember exactly when you tapped off, whether it’s 10:57, 11:00, or 11:02. Now, My Opal can tell you. My Opal is available on Google Play now. Sydney’s second harbour rail crossing has received further funding to provide commuters with more trains and faster services across all of Sydney. The Sydney Metro project has secured $20 billion as part of the NSW Government’s Rebuilding NSW plan which will bust congestion and revolutionise public transport through a new 66 kilometre high capacity rail line. Sydney Metro will help deliver a 60% per cent capacity increase across the entire network, or move an extra 100,000 people per hour across the city.